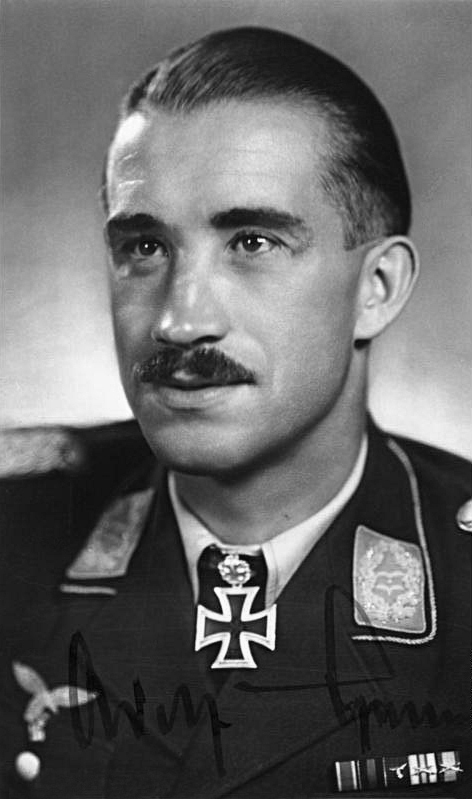 Adolf "Dolfo" Joseph Ferdinand Galland (19 March 1912 – 9 February 1996) was a German Luftwaffe general and flying ace who served throughout the Second World War in Europe. He flew 705 combat missions, and fought on the Western and the Defence of the Reich fronts. On four occasions, he survived being shot down, and he was credited with 104 aerial victories, all of them against the Western Allies. The head and shoulders of a young man, shown in semi-profile. He wears a military uniform with various military above his left breast pocket and an Iron Cross displayed at the front of his shirt collar. On his upper lip is a moustache, his hair is dark and short and combed back, his facial expression is a determined and confident smile; his eyes gaze into the distance.